WATCH | We're on Livestream (or download the Livestream app for your phone or Roku, open the app and search "Idlewild"). LISTEN | Tune in to WREC-AM 600 radio or www.wrecradio.com (click “Listen Live”) or use the iHeartRadio app. We gather on Sunday morning at 8:30 and 11:00 to worship God. Worship at Idlewild brings its members into the presence of the sacred through prayer, song, the reading of scripture and its faithful and imaginative interpretation. Our worship focuses on the challenges of contemporary life as we seek to know and follow God. Shaped by worship, we seek to share God’s grace through education, fellowship, music, and inclusive, outreach ministries to those in physical and spiritual need. Beneath our similarities Idlewild members express and respect a diversity of approaches to belief. Most are seekers, confident in our beliefs but open to new revelations and deeper levels of spirituality. The sermons honor the best of Biblical scholarship along with the compassion of Jesus and in prayer and sacrament we find the Risen Christ present. 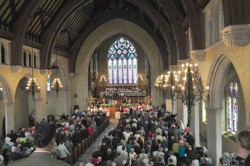 Music at Idlewild borrows the best from our tradition – an organ concert in Paris, a carillon in London, a choir in Stuttgart, a worship service in Rome – while remaining modern and lively. By following along in the worship bulletin, the first time worshipper can easily navigate the service. On a second visit, you’ll know exactly what to do. Explore the links to the left to discover more.